Good morning and happy Wednesday! Remember when I talked about adding indoor plants to our home for the very first time? Well – it’s official: I’ve kept our first indoor plant (a large bird of paradise) alive for over 8 months, and I’ve since added two more (a monstera for our living room and a pink rubber tree for Lucia’s bedroom). I’m obsessed. And now I want to venture into herbs for outdoor, like mint and cilantro. My, how things can change in under a year! Any tips for getting started with a mini herb garden? Please share in the comments! 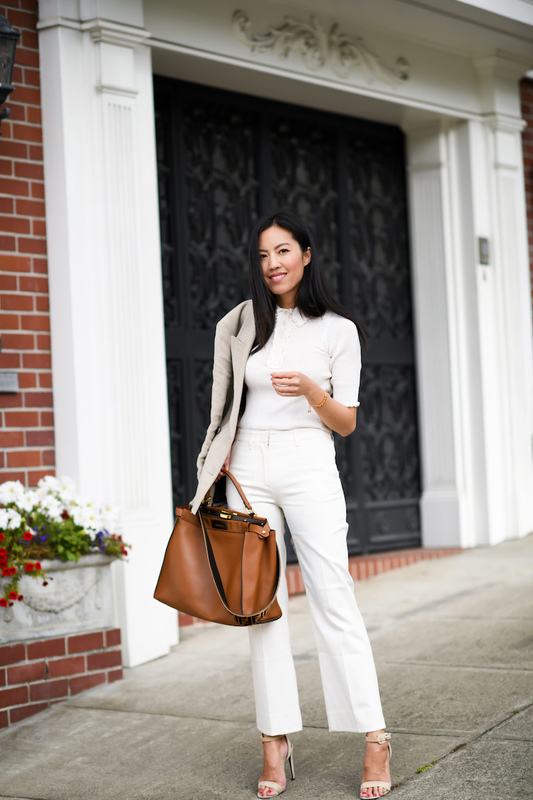 This beige outfit is so chic! And that is awesome you kept those plants alive! For outdoors, I recommend reading the tags that come with the plant. Make sure it suits your outdoor environment! Beautiful, very classy and elegant! Simply classy as always! ???? Congrats on keeping your plant alive 🙂 Herbs are very low maintenance. I currently have mint and cilantro on my balcony. All they need is a little sun and water and they should be just fine. Love your outfit too! This outfit has my favorite colors! Good on you! I have 50 house plants (I have a large villa so not so crazy plant lady). They give me a lot of joy. Another low maintenance indoor plant is the spider plant. I know it’s hard to imagine them outside of the 1970s complete with a brown and mustard macrame hanger, but in a plain white or grey ceramic planter, they’re chic and gorgeous – especially when they start to have babies and grandbabies. Their paler green foliage will be a nice contrast to the darker-leafed plants you currently own. For herbs, a tip is to grow mint in its own pot because it takes over all other plants with its suckers. Not sure about the U.S. but here in New Zealand, coriander (cilantro) grows better in the Winter. Basil loves lots of sun and needs quite a bit of water. Protect your mint (and basil) from caterpillars too – they love chomping it. And finally… don’t let your herbs dry out. Water them regularly.